HCM City (VNA) - Vietnam has great potential in farming swifts for their edible nests, but authorities should make clear zoning plans and regulations related to quality standards, farming and processing, delegates told a forum in HCM City on March 26. According to Nguyen Van Trong, Deputy General Director of the Crop Production Department, the swift nest industry has developed strongly in Southeast Asian countries, especially Malaysia, Indonesia, the Philippines, Vietnam, and Thailand. In Vietnam, swifts are bred in 42 provinces and cities and nearly 68 tonnes of nests are produced annually and increasing. They are exported to many countries and territories including Hong Kong, China, the US, Australia, and New Zealand for 100-125 million USD annually. Deputy Minister of Agriculture and Rural Development Tran Thanh Nam said the swift nest industry offered high economic value. “According to local and international experts, Vietnam’s bird’s nests have very high quality. China has huge demand for bird’s nests. Many large Chinese enterprises want to find long-term Vietnamese suppliers. 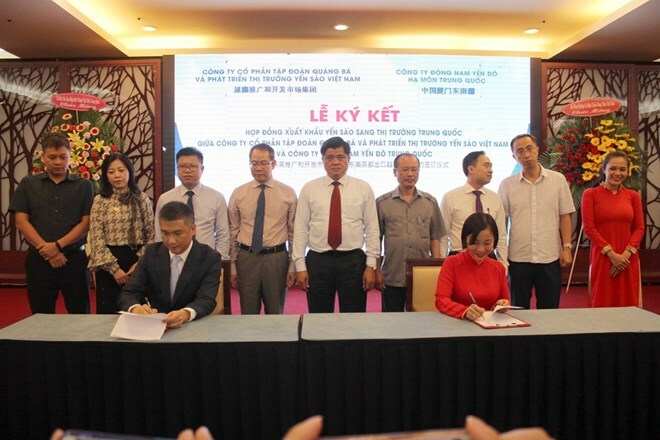 This offers opportunities to Vietnamese firms,” he said. Zhang Yaqin, President of the Guangdong Birds’ Nest Industry Association, said China was the largest market for edible bird’s nest. Imports that received certificates from the Chinese Academy of Inspection and Quarantine (CAIQ) and with traceable origins went up from 3.09 tonnes in 2014 to 84 tonnes in just the first 10 months of last year. Trong said the industry offered high economic value but its development had been unplanned. "There is no master plan for the industry, and businesses do not pay much attention to developing brands for their products," he said. "Vietnamese businesses mainly export bird’s nest in raw material, earning low revenues," he added. Tran Phuong Tuan, Deputy Chairman of the Vietnamese Swiftlet Farming Association, said companies had not invested in processing to improve quality or add value. At a forum on improving bird’s nest quality in line with market demand, Tuan and other delegates urged the Ministry of Agriculture and Rural Development to soon frame regulations for quality and make zoning plans for the industry. According to YiNing Luo, vice president of the China Medical Pharmaceutical Materials Association’s bird’s nest branch, and president of the Southeast Edible Bird Nest Capital (Xiamen) Industrial Development Co., Ltd., China has very strict regulations on importing bird’s nest, especially unprocessed. Most Vietnamese bird’s nest products were imported to China through unofficial channels that when it strengthened inspections, the bird’s nest industries in both countries were affected, he said. Therefore, the two countries needed to sign a protocol for official import of bird’s nest products from Vietnam to China, he said. He said his company, which specialises in processing raw bird’s nest, would continue to help promote official exports from Vietnam to China.